2019 represents my 10th season working for myself as a Wedding Photographer. It was a massive step to take from a reasonably successful career into the unknown, especially with the financial crash happening all around me. But I’ve been lucky enough to go on to photograph some amazing people in some amazing places. I wanted to mark this occasion by looking back over the full 10 years and some of the pictures I’ve taken. But pictures are not about me, they are about the people in them and their own personal story. Below you’ll find a collection of pictures selected by the couples themselves along with the story of why they have picked that one single image from their wedding. It has been a fascinating exercise for me as the Photographer as often they are not the picture I would have personally chosen for them. Thank you to all the couples I’ve been lucky enough to photograph over the past 10 years, especially the ones who have shared a little bit of their own story with us below. They are not in date order, just the order I received them in. “10 years ago this summer. The cliche ‘where has the time gone?’ gets over used. But really?! I remember this moment like it were yesterday…the first kiss! 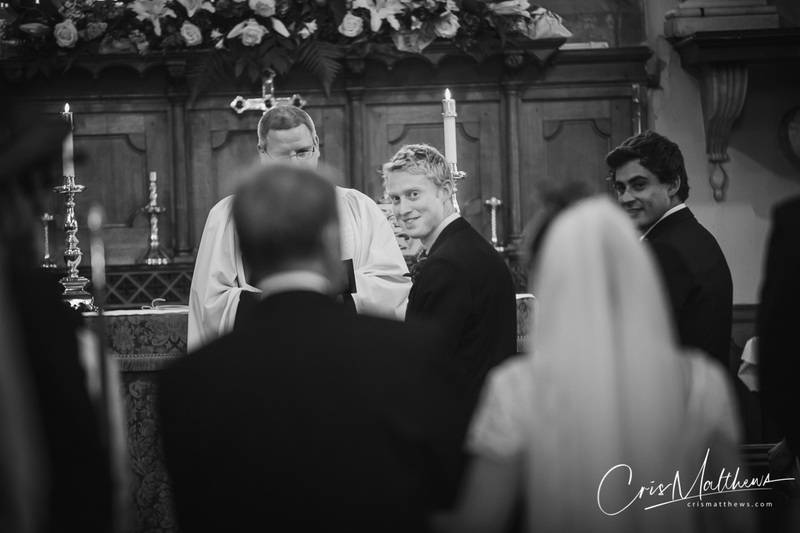 The look in Chris’ eyes and the happiness we felt are seen in my smile! The venue of our marriage was the small family church. This picture reminds me of where we stood making those promises to each other. The same place my Mum and Dad did some 30 years before us, and my Gran and Grandpa before them. I love the detail the photo shows; details of the buttons on my dress, and the sparkle in the veil…decisions that were laboured over! 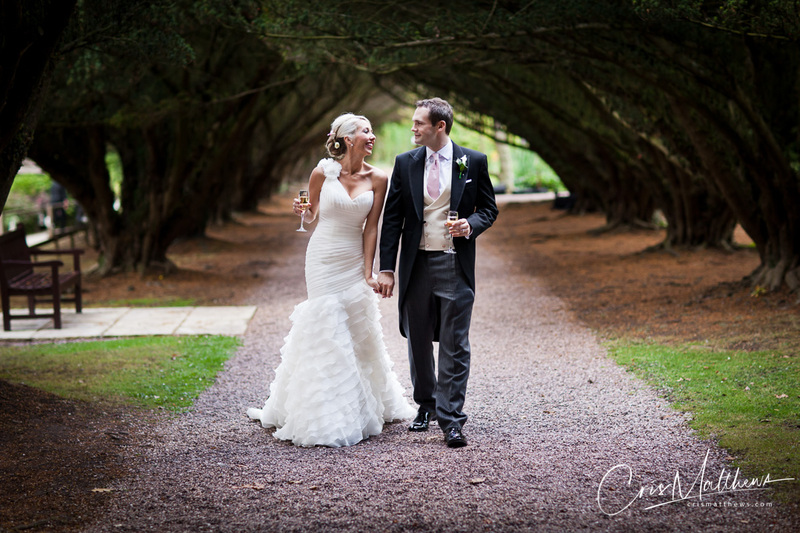 “It’s hard to pick just one shot, we love how this image of us walking down the drive at East Riddlesden Hall amongst all our guests really captures a moment. There’s lots of our friends and family milling around but David and I just look to be in our own little bubble. 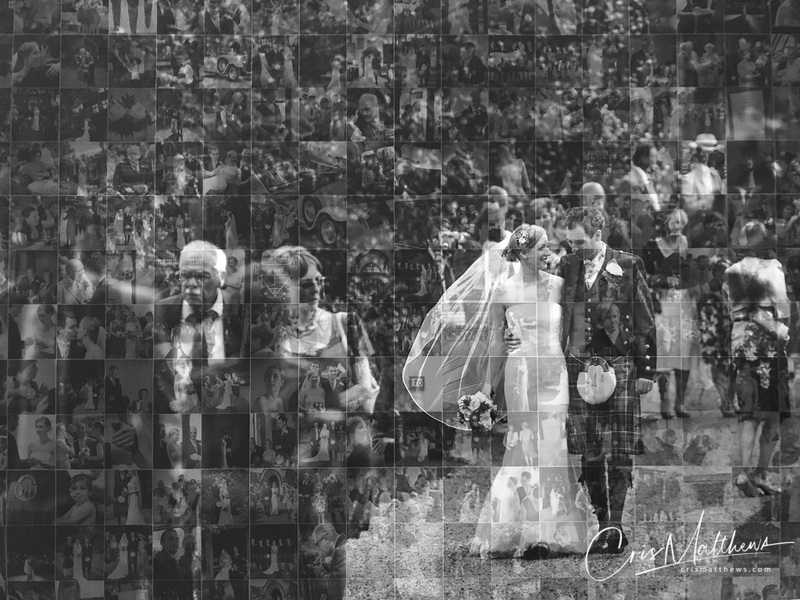 This is a picture of the print my Mother in Law had done for us – it’s our favourite picture made from a collage of all the other shots from the day. Thank you so much for capturing our special day, I am still thrilled with our pictures and I still look at your preview posts of complete strangers weddings when you post them as I just like seeing your beautiful work. “There are several reasons why this shot is a favourite. It’s romantic and striking, and pardon the pun, timeless! I love that having the time above us means that we’ll always know what we doing at that exact moment in our lives. I especially love that I grew up in Chester and walked under the Watergate clock countless times. 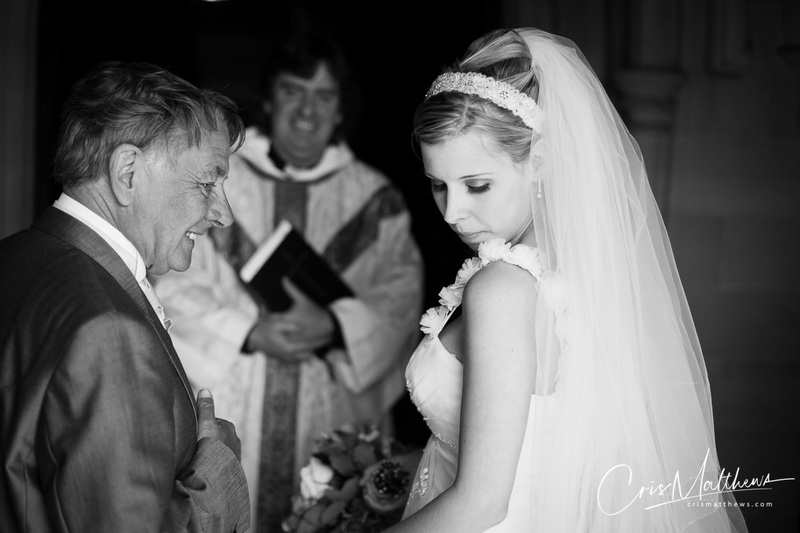 “Cris photographed our wedding in July 2011 and our wedding album remains one of my most treasured possessions. We have some of the photos on the wall, one of just me before setting off to the church and another of us both posing outside the reception venue in the sun where my husband looks like he’s the cat that got the cream. 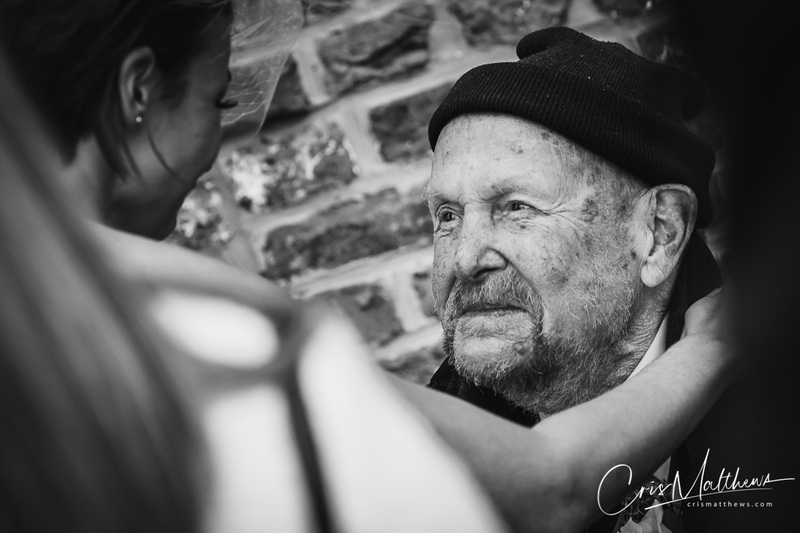 When Cris asked me to choose a favourite and give a reason I found the challenge so tough but the photo I have chosen is so special to me.The church was a 9 mile drive from the reception venue where I’d got ready in the morning. Me and my dad enjoyed the journey in style in a beautiful open top car; the sun was shining and the mood was serene. “First of all, I’ve probably at least five photos that I cherish the most out of them all, for different personal reasons. So it’s quite hard deciding. However probably my favourite of all is the one I have attached, where we are watching our firework display. 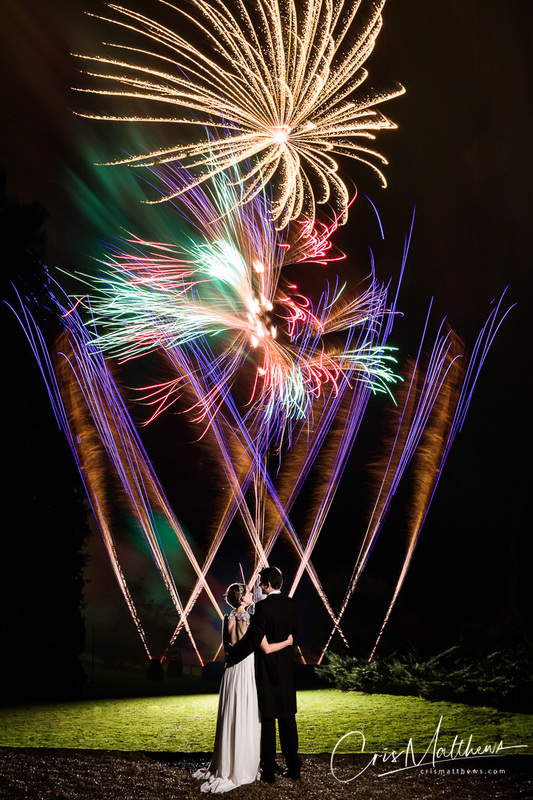 Myself and Ants met on bonfire night and as a small child I’ve always loved fireworks, so I knew I had to have them as part of my big day. My dad had died shortly before we were due to get married, we were extremely close. I’ve never really know what to believe about what happens when people are no longer with us, but on that day I remember thinking if he’s up there somewhere he’ll be able to see all these amazing fireworks and he’ll be smiling. It was one of your first fireworks display and I was blown away. Note from Cris – So nice to hear we were able to create such a special memory for you Merle. Your day was very special for me aswell. Thank you so much for trusting me with not only the photography but the fireworks too! It was one of our first shows and you can still watch the video of it here. “Dan and I have been married over 2 years now. It’s a tough decision to pick just one photo, as there are so many that we treasure. This is my favourite picture although it doesn’t have my husband Dan in it! It’s just perfect my dad never ever lets any emotion show what so ever so for this look in his eye just melts my heart every time I see it. The day definitely showed us all that he actually does have feelings. 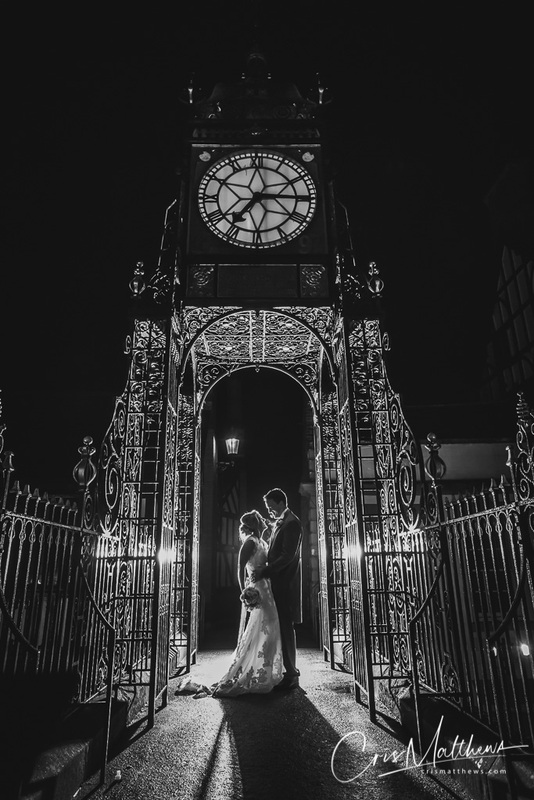 He made me feel at ease because I was terrified of walking down that aisle..
“It was difficult to pick just one favourite photo, they are all so amazing and are such incredible memories of such a wonderful day. This photo we feel really captures the fun and relaxed nature of our day. 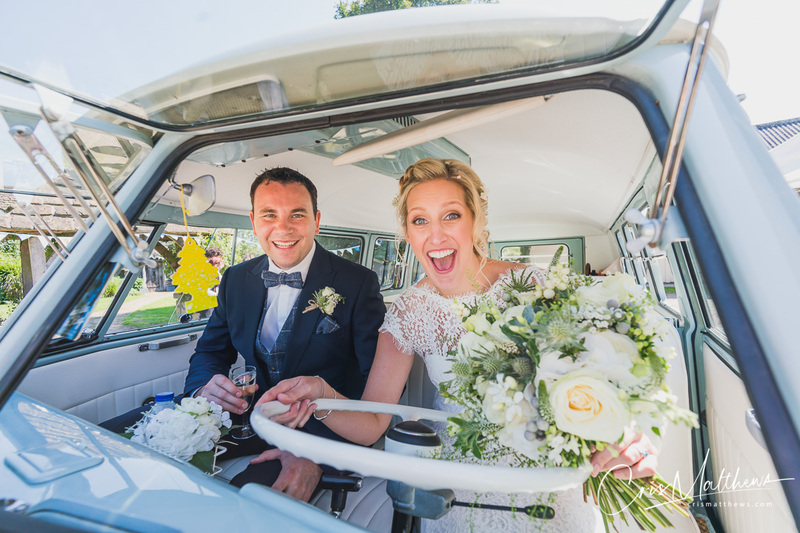 Paul and I had just driven down the long bendy track to our reception venue and having that time to process and realise we were married was amazing! I love how happy we both look at the realisation we are married. All the photos Cris took in the Kombi Van were so fantastic, there is one where he even managed to get 5 children under 5 all looking happy, which is nothing short of a miracle! “I love so many pictures it was really difficult to choose. I decided on this one because it captures perfectly not only how happy I was, and my family were, on my wedding day but it also captures the relationship I have had with my two brothers throughout our lives. We always make each other laugh in almost any situation. “I love ALL of our wedding pics, I look at them every single day. This one however….. it’s not just a photo, it’s the emotion, captured perfectly, and completely natural. I got my man! Absolutely worth the wait, Love him to pieces, never letting go. 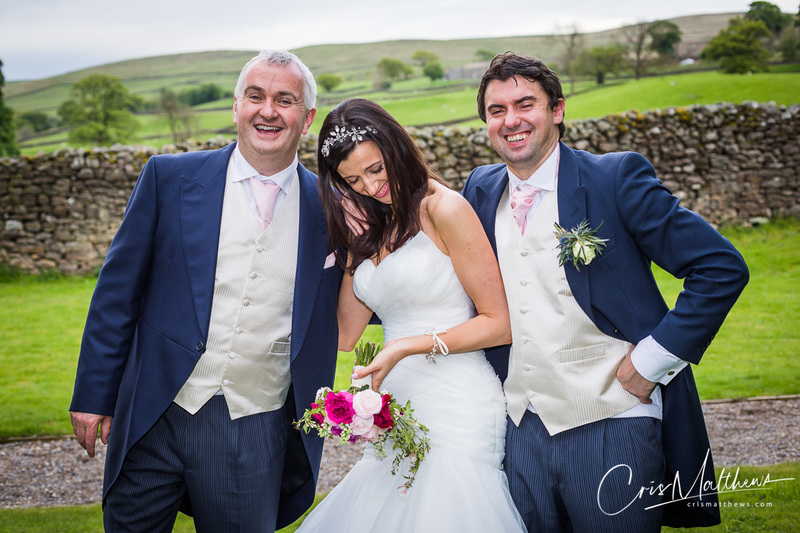 “We were so pleased when Cris said that he was available to take our wedding photographs. 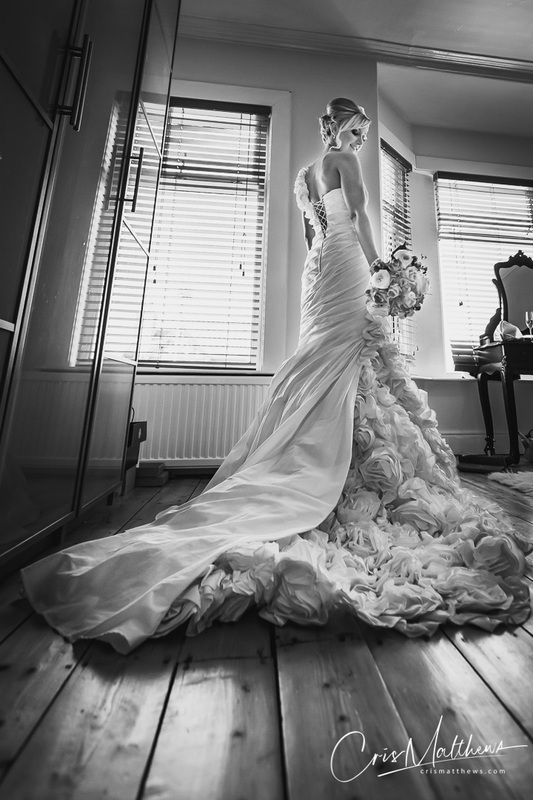 I knew his wife and had followed his work for a while knowing that if I ever got married they were the types of photographs I would want to capture our special day. 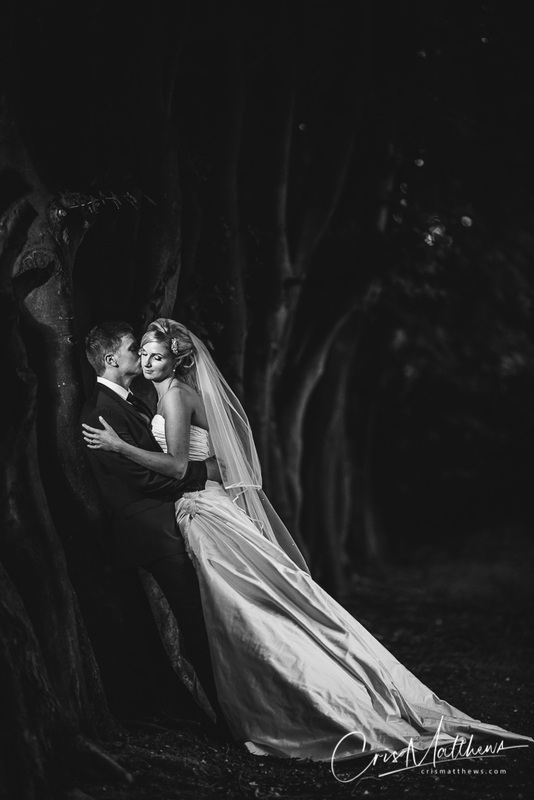 We were over the moon with all of our photographs so it was very difficult to choose just one. We chose this picture as it captures the moment perfectly. This photograph was taken just as the sun has gone down after our day time reception, it was the first moment that we had had all day to just take a breath and reflect on the day so far. 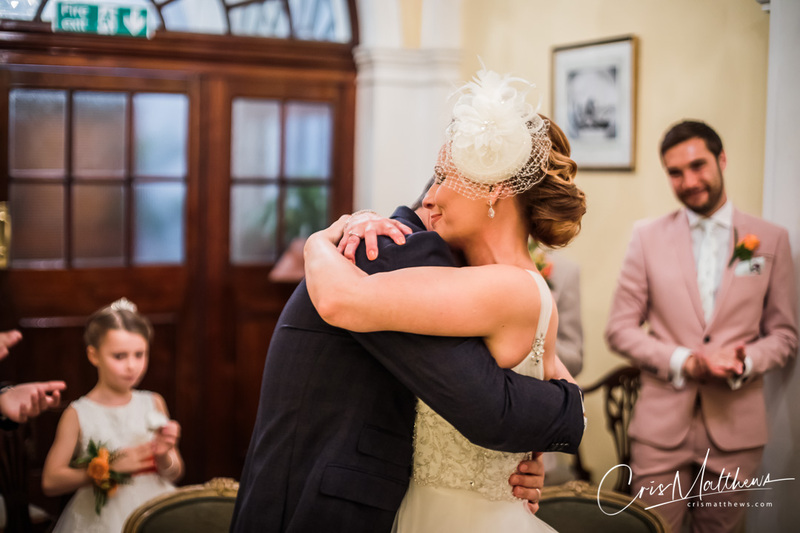 Secondly we feel it captures our love and feeling for each other perfectly, we had had a rough few weeks leading up to our wedding loosing someone very special to us and we feel that this photograph encompasses our strength and connection as a couple. “Wow, I can’t believe it’s been over 8 years since we got married! 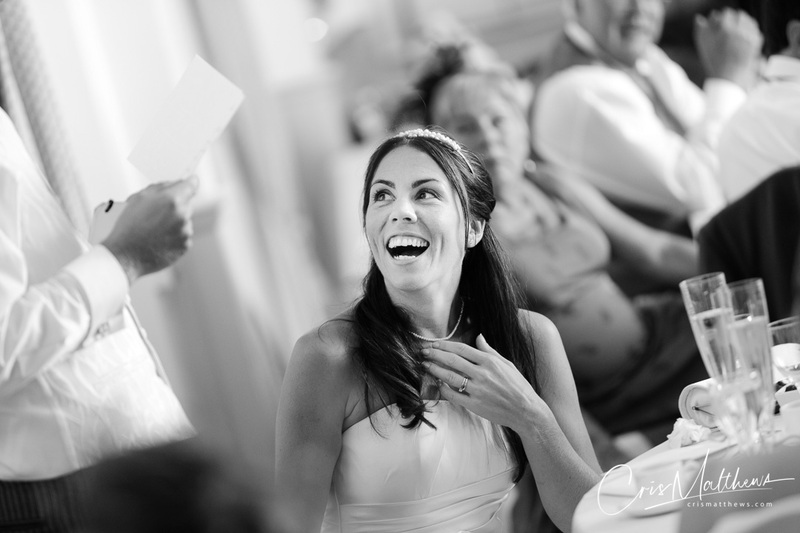 Cris totally captured the essence of our day in some of the most amazing photographs. Looking back on them, they bring real joy and wonderful memories. This one in particular is one of our favourites as it was during Steve’s speech. He had just announced he had a ‘happy wedding day’ card for me from the money guru Martin Lewis (who had indirectly played a role in me meeting Steve 18 months before!). This picture really captures the love and delight I felt at that time and even now, brings it all rushing back to us both. 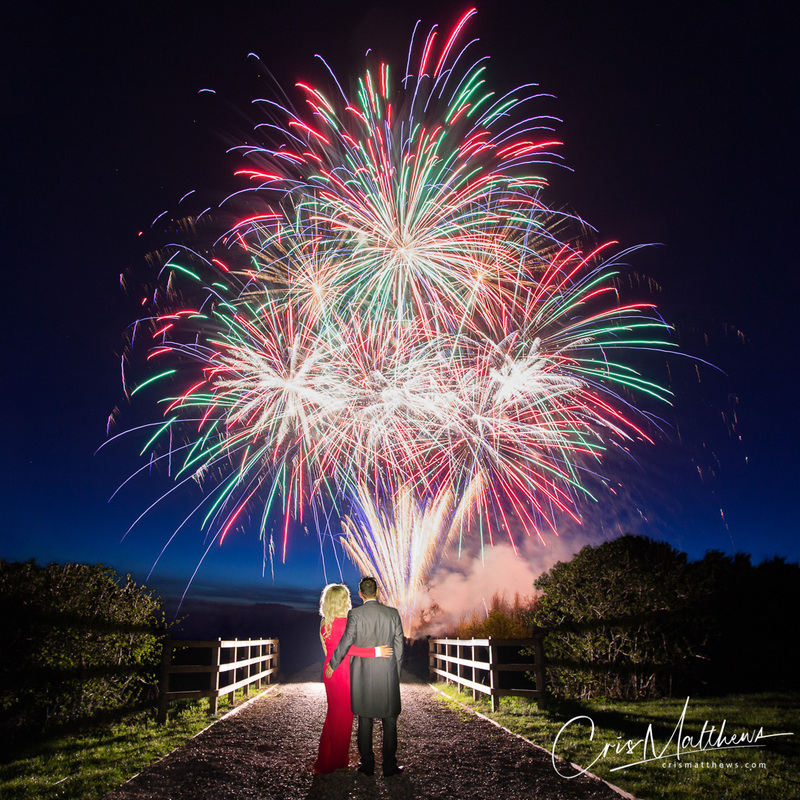 …..but for Cris to capture us both with the spectacular firework display brings back fabulous memories of the love, laughter and celebration of our special day. Everyone who has seen this photo has commented on how amazing it is and we have yet to see another photographer manage to produce an image as powerful as this one. 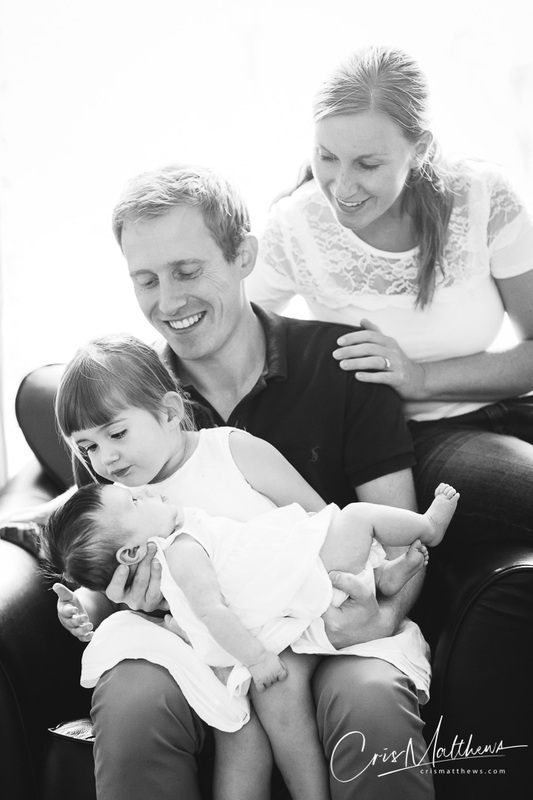 “The most precious thing I remember from our wedding was a feeling of joy and happiness. My face hurt as I went to bed that night after an amazing day! This is why after much deliberation I have chosen this photograph from all of the wonderful images that Cris captured. 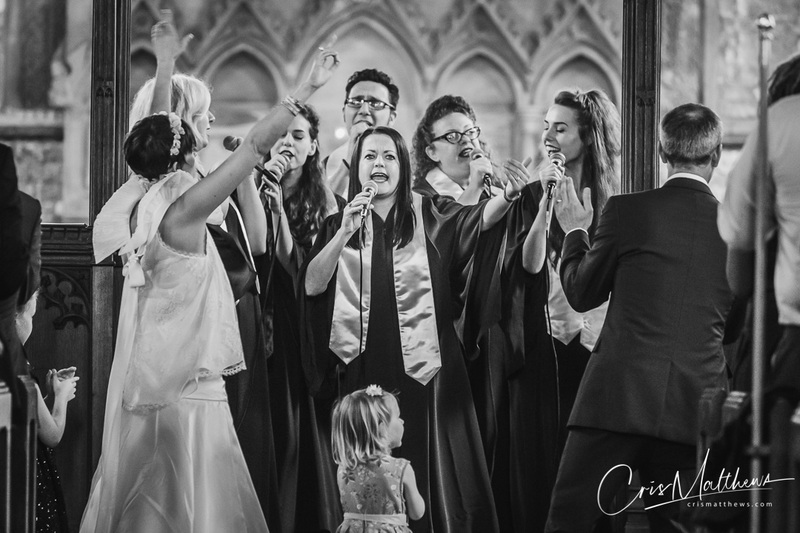 Duncan and I both love music and so the opportunity to have a gospel choir perform in church in our sleepy little rural village in Lincolnshire was one we had to grasp. I remember dancing down the aisle as their singing filled every nook and cranny of the nave. The congregation joined in, eventually even Duncan felt relaxed enough to throw some shapes and my Niece jumped out of her aisle to bust a move! “This picture is simply special to us because it captures many things about our wedding day that we wanted to encompass in one place. We chose to work with Cris due to his unique style and feel for a situation allowing capture of a specific moment that without being “behind the scenes” you as a couple do not even get to see either. The Ball Room was hidden from guests the whole evening with people wondering what was happening behind there and it builds a level of anticipation and excitement. Our Best Man can be seen to the left and he was the only one privy to the band and awesome dance space that lurked behind. 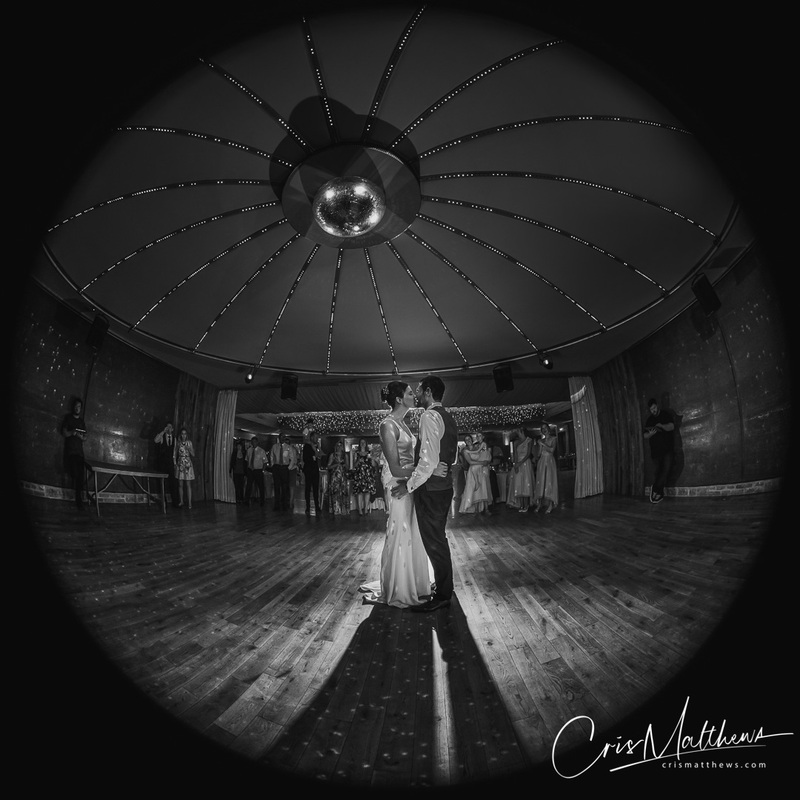 Cris worked himself into a position without us knowing and created this unique Sphere – almost MC Escher esque photo of us just as the curtains were peeled back to reveal our more than nervous ‘1st dance”. “My husband, Mike, and I booked Cris to take our wedding pictures in 2010, and shortly after found out that we were expecting a baby. We had to delay the wedding by a year and Cris was amazingly supportive, and even came and did some “bump” shots for us and some gorgeous newborn pictures when our son, Jake, finally arrived – which still adorn the Grandparents’ walls to this day. Our wedding was at Christmas the following year and to say picking a “favourite” photograph has been hard to do is an understatement. There were so many lovely ones of Mike and I, of us with Jake and of our family and friends enjoying the day. I know it was mine and Mike’s wedding day and I should really pick one of us (sorry hubs) but my favourite picture is one of Jake and I at the night do. For us to have Jake with us on our wedding day was amazing and this picture sums it up for me. It’s one of those pictures we didn’t even know were being taken, but it is quite simply priceless. 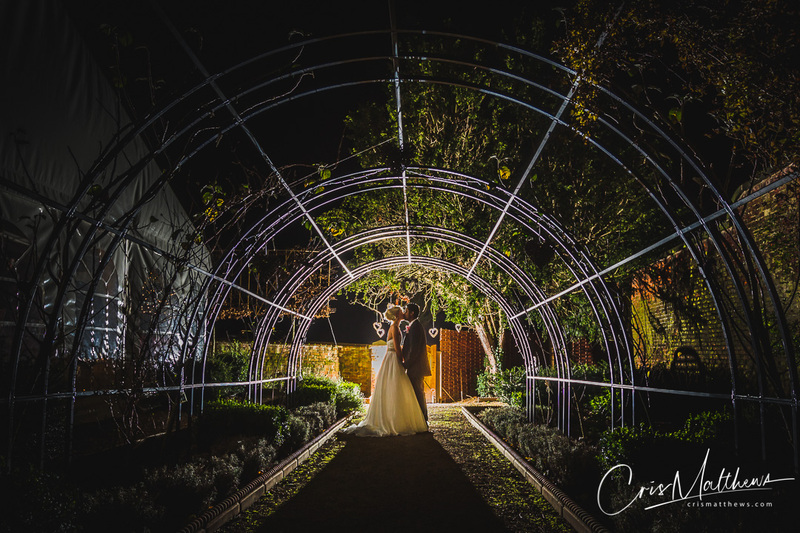 “Cris was recommended to us by a friend of mine and from the minute we met and saw his work we knew he had to be our photographer. Our wedding was in the October of 2010, a crazy amazing day from start to finish, and our wedding album captures the emotion of the day exactly, its full of wonderful images of us, family, friends and some lovely intimate, otherwise unseen moments. I jump at the chance to show it to people still, any excuse to be transported back. 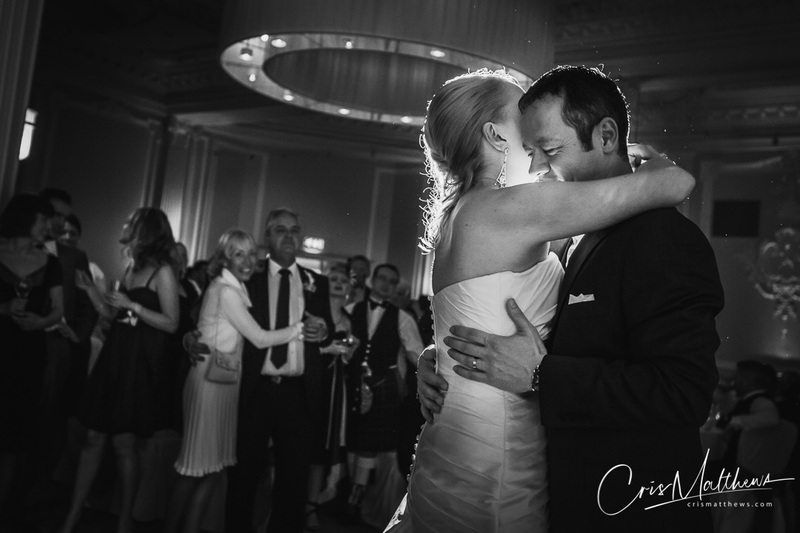 There are a number of pictures we love from the day – But the one we chose is of our first dance. It was getting later and I remember feeling in that moment that we were the only 2 people in the world, just us in a wonderful loved up bubble ready to take on whatever life had in store. We love that my Dad and James’ Mum are looking on waiting to join us, big smiles, full of pride. “I’ve picked that picture because it was one of the 1st that Cris sent us as a preview on the day of the wedding. I loved my dress so much and I loved the way it looked in the picture. I really felt like a superstar that day and the image just really captured that for me. 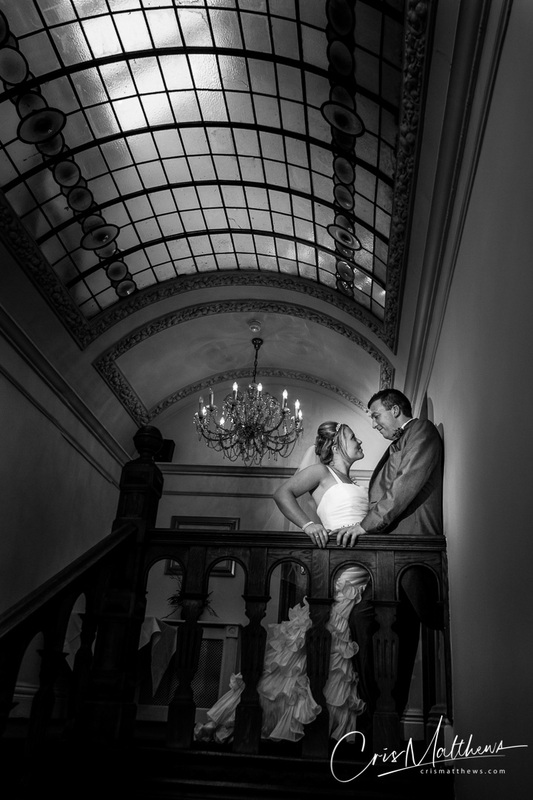 “This is one of my favourite pictures from our wedding day on the 4th February 2012 at the West Tower in Aughton. I think the picture really shows the love in our eyes for each other after being childhood sweethearts. 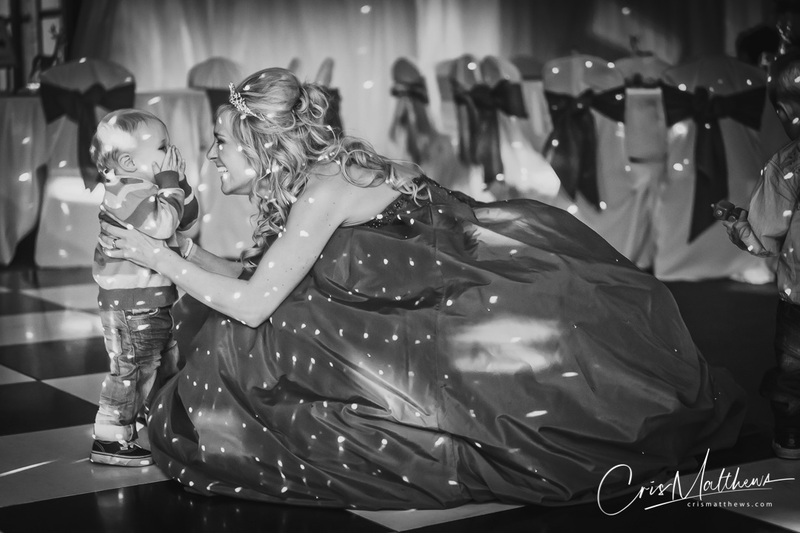 Cris took so many beautiful pictures of our special day and we have many precious memories. “We love this photo (hard to pick our fave!) as it just captures the venue we were married at perfectly. The walled garden at Beeston Fields had only just opened for weddings and the gorgeous archway was one of the reasons we loved our venue! “It took us some time to choose our favourite photo as there are many we find special for different reasons. 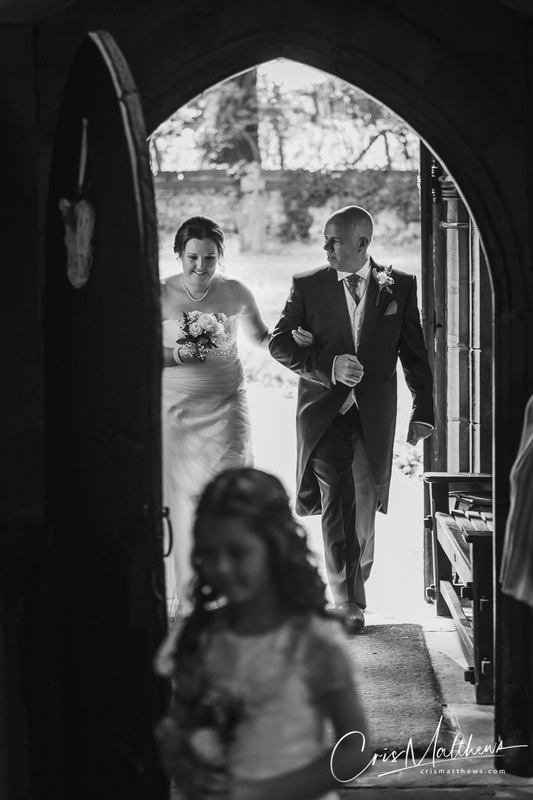 However, we love this photo as it brings back memories of walking out of church and feeling like we were on cloud nine, realising we had just got married! 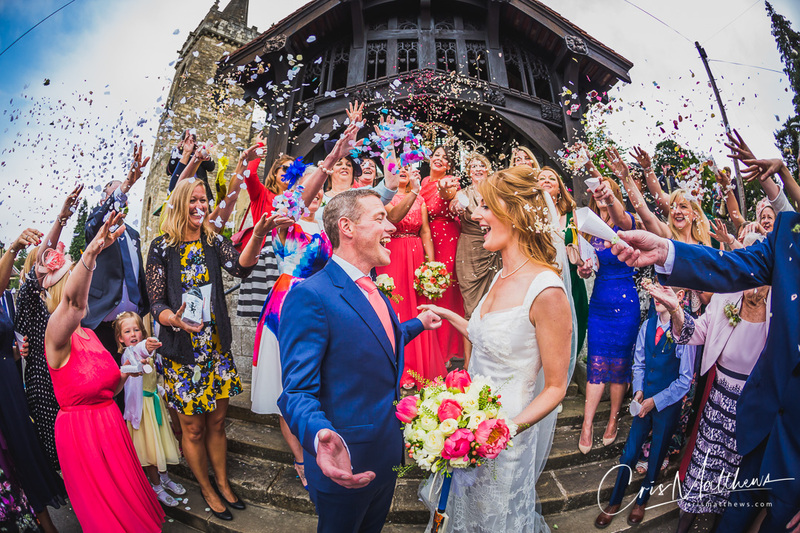 We love the bright colours, and despite the ‘staged’ confetti throw, the image looks very natural. It also captures so many of our friends and family and we never get tired of zooming in to look at the expressions on their faces. “Wow this was very hard to pick one photo! But I think it has to be this one of Grandpa Den, the most beautiful photo of him! I am so lucky Jon asked me to marry him, to then be so lucky that my Nan, Vivienne and Grandpa Den could make it to our wedding. Sadly both grandparents have passed away now. They are missed everyday! “It was the lovely stroll around the grounds of New Hall, when we had a quiet moment to ourselves and I think this shot captured the joy and fun of the day. When we catch up with friends they still mention the copious amounts of champagne there was at our wedding and how everyone had a great time. “Cris photographed our wedding in July 2016. It is so hard to find one photo that sums the whole day, as there are so many that we love and have framed around the house. However I think this photo captures the moment perfectly when I walked down the aisle. Tom looks so happy, and it immediately takes me back to that day bringing back all those happy memories from the church to the reception. Cris has a way of taking photo’s without you realising and capturing this special moments that you will treasure for ever. 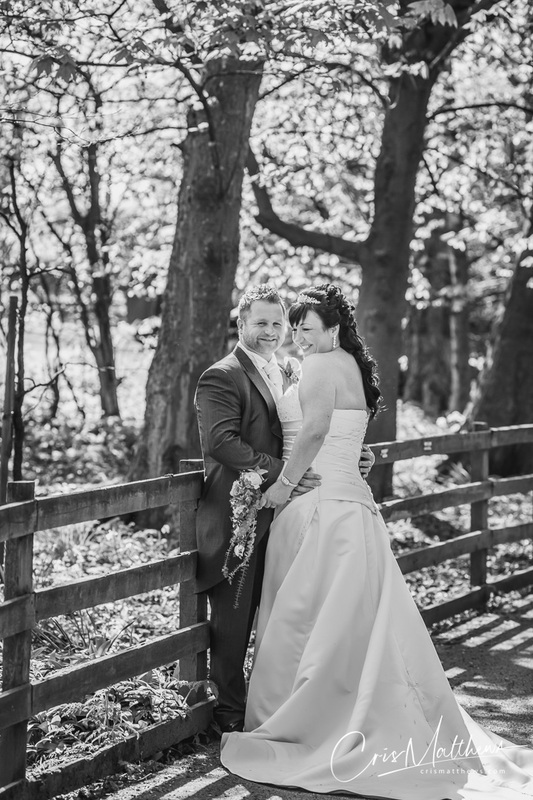 “I can’t believe its nearly been 5 years since our amazing day. When James and I spoke about your request this picture immediatley camr to mind. We both choose this picture as it was a really funny memory. It was taken when we went walking through the grounds with Cris after the ceremony. The day before the wedding James and I agreed not to have in food or eat any garlic due to us spending most of the next day close to one other and speaking to our guests. As soon as we were posing for the picture James spoke to me and then came a strong smell of Garlic. Only then to reveal that by accident (Yeah right), he had ordered a Chicken and Garlic Pizza the night before while with friends.